Everything tastes better when it's "Chocolate Covered"! 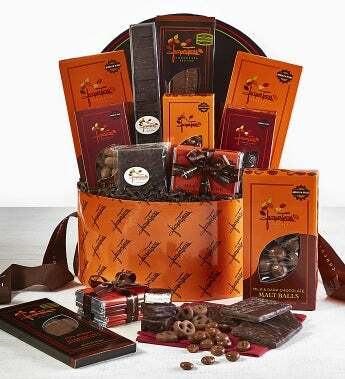 This gift basket contains the most prized of Jacques Torres' chocolate-covered favorites! Gift Set Includes: Milk Chocolate Cheerios (CHEERIOS is a registered Trademark of General Mills), Dark Chocolate Corn Flakes, Dark Chocolate Graham Crackers, Chocolate Covered Marshmallows, Espresso Beans, Milk Chocolate Raisins, Milk Chocolate Pretzels, Small Dark Chocolate Almonds, and Malt Balls all presented in a beautiful signature hat box. Jacques Torres has been named a James Beard Pastry Chef of the Year, Meilleur Ouvrier de France (Best Craftsman of France), the Chefs of America Pastry Chef of the Year, and Chartreuse Pastry Chef of the Year. His chocolate has been featured in The New York Times, USA Today, NY Magazine, Food & Wine, CBS News & more. Jacques Torres hosted a television series, Chocolate with Jacques Torres, on the Food Network, and released a 52 episode Public Television series, Dessert Circus with Jacques Torres. In 2018, Netflix released worldwide a baking competition show, Nailed It, in which Jacques is the featured lead judge on the series. *We reserve the right to substitute any item of equal value. Container shape and color may vary. * Allergens: Prepared/packaged using machines that process dairy, soy, wheat/gluten, fish, eggs, nuts, tree nuts and peanuts. Contains nuts, peanuts, milk, soy. We reserve the right to substitute any item of equal value.